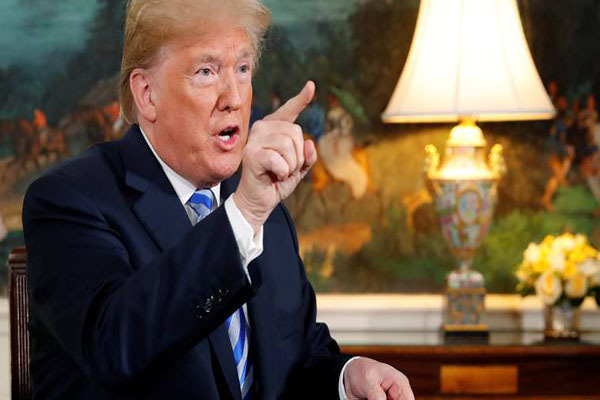 Washington(PTI): President Donald Trump today described as “animals” some illegal immigrants as he slammed the US’ “dumbest” immigration laws and asserted that people based on merit should only enter America. Venting out his frustration at officials in both Mexico and California, Trump vowed to strengthen the US’ “weak” immigration laws. “We have people coming into the country, or trying to come in – and we’re stopping a lot of them – but we’re taking people out of the country. You wouldn’t believe how bad these people are. These aren’t people. These are animals,” Trump said during a California Sanctuary State Roundtable at the White House. “We are taking them out of the country at a level and at a rate that’s never happened before. And because of the weak laws, they come in fast, we get them, we release them, we get them again, we bring them out. It’s crazy,” he said. Trump blamed the influx of illegal immigrants in the US on the country’s “dumbest laws”. “The dumbest laws – as I said before, the dumbest laws on immigration in the world. So we’re going to take care of it, Margaret. We’ll get it done,” he said during the roundtable which was attended by political leaders and law enforcement officials from California. Trump said California’s law forced the release of illegal immigrant criminals, drug dealers, gang members and violent predators into the communities. “California’s law provides safe harbour to some of the most vicious and violent offenders on Earth, like MS-13 gang members putting innocent men, women, and children at the mercy of these sadistic criminals. “But we’re moving them out of this country by the thousands. MS-13, we’re grabbing them by the thousands and we’re getting them out,” he said. “Part of the problem that we have is our economy is so strong that people are pouring up to get into our economy. They want a piece of our economy. And that makes the job even tougher,” he said. “But we want people based on merit. We want people to come into our country based on merit. We’re not looking to keep them out. We’re looking to bring them in. We need them,” Trump said. “We have companies moving back into the United States like never before. Chrysler is opening up now in Michigan. We have so many companies actually coming from Mexico, even, and coming back in. So we want people coming in based on merit,” he said. Last month, Trump signed an executive order directing the deployment of military along the US-Mexico border to fight illegal immigration, asserting that the situation had reached “a point of crisis”. According to the White House, more than a thousand people a day and more than 300,000 a year violate “our sovereignty” by illegally crossing the border.